GSMA has a network economics case study from China Telecom on their future networks website. This case study focuses on the challenges of CapEX and OpEX of small cell backhaul. For coverage and/or capacity enhancement purpose, small cells will be deployed widely in the future. As the number of small cells deployed increases, larger bandwidth and higher flexibility are required for the backhaul transportation, which consequentially leads to higher CapEX and OpEX. Therefore an economic and practical approach has to be put forwarded and verified. China Telecommunications (CT) is one of the largest state-owned telecommunication companies in China. With the world’s largest broadband Internet network, Frequency Division Duplex – Long Term Evolution (FDD – LTE) mobile network, China Telecom is capable of providing cross-region, fully integrated information services to global customers through its sound customer service channel system. In this case study, CT proposes a small cell backhaul based on Passive Optical Network (PON) system, which can reduce at least 80% of the trunk fibre and 50% of associated fibre. As a result making facility room and air-conditioning unnecessary. Therefore the CapEX and OpEx of small cell deployment could be reduced effectively and remarkably. As networks evolve through 4.5G to 5G with more complexity, network densification and intelligence at the edge, the need will be even greater to optimise transport network architecture within mobile Radio Access Network (RAN) to resolve the challenges of backhaul/fronthaul demand and the corresponding increase in costs (CapEX and OpEX). Small cell backhaul based on Passive Optical Network (PON) system is proposed, which can reduce at least 80% of the trunk fibre and 50% of associated fibre and facility room and airconditioner are no longer required. China Telecom has conducted laboratory and field test in Hubei City and Shanghai with Huawei and ZTE. The test results proved the feasibility with equipment and performance KPI’s satisfied. Backhaul based PON could be one of the preferred choices for small cell backhaul transport. CT selected seven outdoor sites and one indoor site in Hubei, and eight outdoor sites in Shanghai. All the small cells were linked to EPON (Ethernet Passive Optical Network) equipment, which had been updated (software and hardware) to support frequency and time synchronisation. 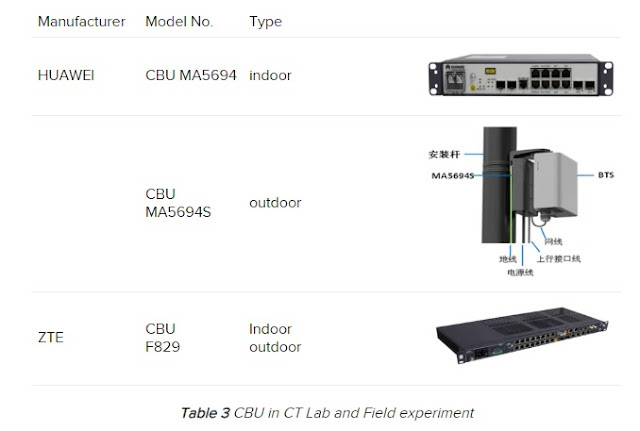 Detailed information about CBUs (Cellular Backhaul Units) and small cells in CT laboratory can be seen in the picture above and more details are provided in the case study. Chengliang Zhang, Vice President of China Telecom Beijing Research Institute, China talked about "Optical Networking in the Cloud and 5G Era" which is embedded below.